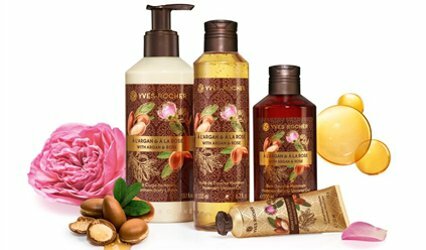 From Yves Rocher, Peach & Star Anise Shower Gel. "To top up your energy levels under the shower or in the bath, our Botanical Beauty researchers have selected and combined organically grown Aloe Vera, essential oil of Star Anise* and a Peach extract." Currently on markdown in the UK, 200 ml for £2.99 or 400 ml for £3.99. 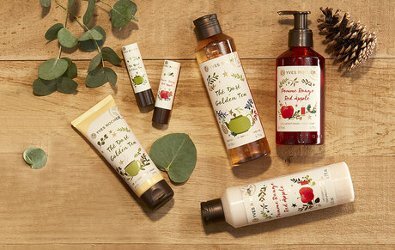 Yves Rocher's holiday collection for 2018 includes a bunch of items (many more than are shown here, including candles and hand creams and bar soaps) in two fragrances, Thé Doré / Golden Tea and Pomme Rouge / Red Apple, at very reasonable prices. There's also an advent calendar for $59.